Conservation of endangered species can often come into conflict with the lives of the indigenous people who live with them. In the Gulf of Venezuela, protected species of marine turtles are used for consumption and trade by the people living there who rely on them for their livelihoods. Research published in Marine Biodiversity Records takes a closer look at this difficult situation, talking to the indigenous people about the roles turtles play in their culture and makes suggestions to improve conservation efforts. Cultural traditions around the trade and consumption of marine turtles mean that in some areas legislation in place to protect turtles is being disregarded. Research conducted over a 15 year period across the Guajira Peninsula in the Gulf of Venezuela found that despite it being illegal, trade and consumption of marine turtles was widespread. The researchers found that at least four species of marine turtle (green turtle, hawksbill, loggerhead and leatherback) were being traded in the area for their meat, carapaces and turtle oil derived from fat. Green turtles were the most commonly traded species while the most expensive products were derived from hawksbill turtles. This activity is a concern for conservation efforts, with trade and consumption putting pressure on local populations of turtles. In the Gulf of Venezuela green turtles, which are classed as endangered on the IUCN red list, are the species most impacted by commercial consumption. Wayuú who are based around the coast are known as “Apaalanchis” and describe themselves as shepherds of sea. They use marine turtles to sustain their culture. Marine turtles have played an important role in many cultures for thousands of years, serving both utilitarian and mythical purposes. Today, the capture of marine turtles for the intent of consumption is mostly linked to small scale fisheries in tropical, developing countries. One such community are the Wayuú, the indigenous people of the Guajira Peninsula. Wayuú who are based around the coast are known as “Apaalanchis” and describe themselves as shepherds of sea. They use marine turtles to sustain their culture. Between 2002 and 2017 the researchers collected qualitative data interviewing Wayuú people working in industries connected to the use of turtles such as fishers, wholesalers, restaurant owners and buyers. They combined this data with observations in the markets and trading centers of the Guajira Peninsula. Leatherback turtle oil bottled to be sold or exchanged between families. While the consumption and use of marine turtles is clearly vital for the Wayuú people, in Venezuela it is illegal under national government legislation and presidential decrees, as it is in the majority of Caribbean countries. Venezuela is also a signatory state on several international treaties protecting marine turtles. The Wayuú are not ignorant to these laws but see the use of the turtles as correct and culturally legal. The authors found little evidence of regulation or enforcement preventing the Wayuú from using and trading sea turtles. “We know that is considered illegal, but we need to use the turtles to buy goods”. Green turtles in the market place (Los Filúos) awaiting the final buyer(s). Legislations that are seemingly contradictory to the wildlife protection legislations also hinder their efficacy. For instance there is legislation stating the indigenous people in Venezuela have rights to use the regions natural resources. On top of this the Indigenous and Tribal Peoples Convention, an international treaty signed by Venezuela, protects the traditional use of natural resources. The persistent use of marine turtles that the authors found highlights the need for gathering more data on population sizes and stability of turtles in the area. We can then begin to ascertain the true impact of their use by humans. 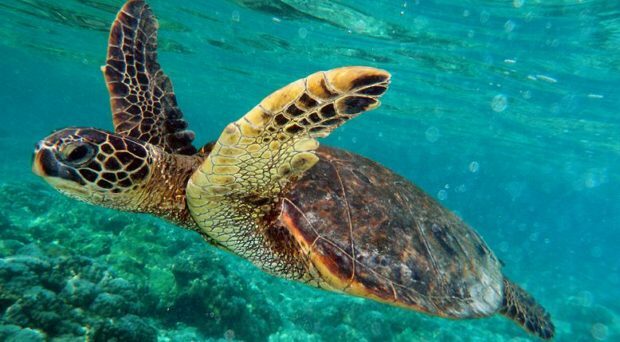 The authors propose that if a legal exemption on the use of marine turtles is be made for the Wayuú then it is likely that the commercial component of turtle use would need to be removed. A similar provision occurs in Australia, where the Aboriginal and Torres Strait Islander People hold a legal right to continue cultural, non-commercial, use of marine turtles under Australia’s Native Title Act. In Venezuela the local NGO “Grupo de Trabajo en Tortugas Marinas del Golfo de Venezuela (GTTM-GV)” is currently carrying out a bilingual conservation-portfolio to address the use of marine turtles in the area with the support of local stakeholders. To effectively protect these vulnerable and endangered animals, support is needed for the entities involved so that they can develop effective management plans to differentiate between traditional and illegal use of turtles and manage this along cultural and ecologically appropriate means.